Here's a holiday or "anytime" ornament for a friend or family member who has started a first job or new job as a chef or who simply deserves recognition for her talent. The chef female brown hair personalized Christmas ornament will prove to be a delight when it arrives in our exclusive velvet bag and ready to display with an attractive cord already attached. 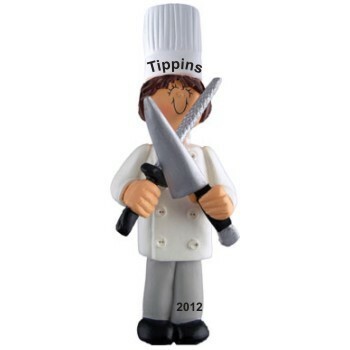 We hand letter these chef ornaments personalized with a name and the year. Surprise your favorite chef with the brunette female chef personalized Christmas ornament that also comes in blonde, African American and male versions!